We drive traffic to your website using the latest techniques, and make the experience inviting and engaging once they get there! SEO, SEM, PPC, Contests, Name and email capture, geo targeting, retargeting, social media, print-to-web and mobile. Here is a fun effective idea! 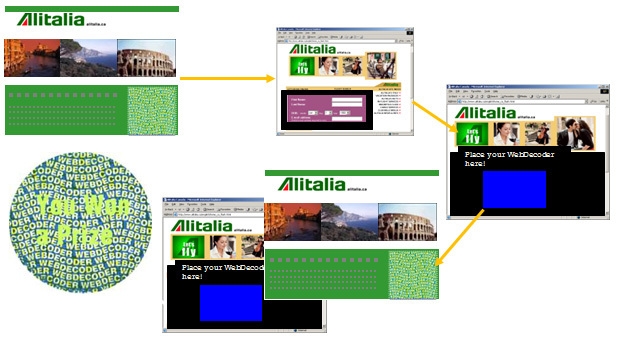 WebDecoder® technology conceals a hidden message or image that can be revealed using a unique chromatic decoding image on a web site, TV, kiosk, large screen displays, or a POP display. The WebDecoder®; game piece is decoded by the consumer by placing the game piece over a specific colored image that allows the message to be revealed. Although able to work through various mediums, the core of the WebDecoder technology drives consumers to either go to a client’s website or to a specific location such as a retail store, special event or trade show exhibit. Response rate have ranged from 10% to 35%.